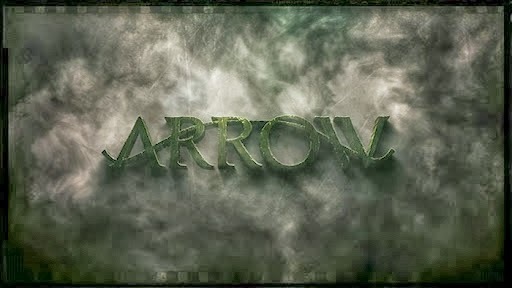 Back of the Head: Arrow 2x3 - "Broken Dolls"
The episode turned out to be largely a Brave and the Bold team up between the Hood and Officer Quentin Larry Lance. (Larry's his middle name? Yep.) An old serial killer escaped from Iron Heights prison named Barton Mathis is back to killing. He's known as The Doll Maker, because he kidnaps girls with beautiful skin and pumps them full of chemicals to turn them into dead human dolls. For a villain no one's ever heard of before (not a famous DC property), it takes the combined efforts of The Hood, Lance, and the Black Canary to finally stop Barton Mathis, and this is after Felicity bravely volunteered to be the bait in a sting operation that almost got her killed. Felicity merely escaped with a floggin' on the noggin. Mathis resorts to kidnapping Laurel and Quentin, and nearly turns Laurel into an action figure before her time, until she's saved by The Hood. The Black Canary provocatively somersaults into action and takes on Mathis, but is felled by the Clangy Poles of Doom. Two arrows from The Hood put Mathis down, but the Canary delivers the kill shot and disappears. But in all the hoopla to finally put the Doll Maker in a box, we learned an awful lot about the Lances. The irony of Laurel, who was The Hood's season one ally, and Quentin, The Hood's season one adversary, switching roles wasn't lost on them. Quentin's psychoanalysis of his daughter finally gleaned that she's been blaming The Hood for Tommy's death when she deep down blames herself for putting Tommy in the position where a building fell on him during The Undertaking. (Quentin's line: "A guy with a bow and arrow can't stop a building from falling on someone" is apt and funny.) Quentin palling around with The Hood, somehow managing to resist sneaking a peek at his face the whole time, gave him the urge to give his Vigilante buddy a new name, one he shares with Laurel: The Arrow. So to the Lances, he's The Arrow now. But it seems to just be a Lance family name for now because they never bothered to inform The Hood of this suggested new moniker. Something tells me he'll keep it when he finds out. But here's the big one, the one that rocks the Arrow Universe: The Black Canary returned to her clocktower and is confronted by a ninja who demands she return to the service of... R'as Al-Ghul! R'as Al-Ghul! The Demon's Head! (Is there a Batman in this universe? Maybe, maybe not. But there is R'as Al-Ghul.) Savor the possibilities of what this means, that Black Canary is a member of the League of Assassins/Shadows, and what this bodes for the future of Arrow. Nerd. Gasm.